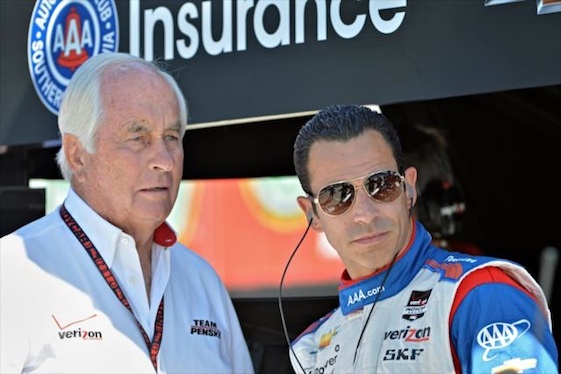 INDIANAPOLIS – Age has never been anything more than a number for Roger Penske. 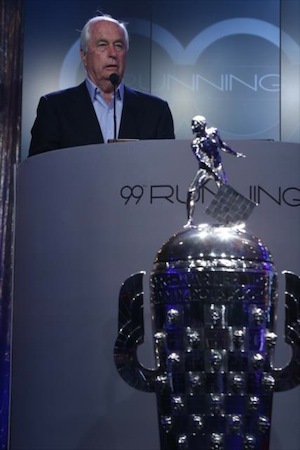 The white-haired entrepreneur remains as energetic and vital as ever as his four-car team prepares for Sunday’s 100th running of the Indianapolis 500. Coincidentally, it is also Penske 50th year as a team owner. At nearly 80, Penske still keeps a schedule that would likely disable most younger men. It’s not uncommon for him to be in Germany on Wednesday, Brazil on Thursday and back in his Detroit office on Friday as he oversees his multi-billion dollar international business empire. He sleeps when he can, although he definitely believes sleep is overrated and a waste of valuable time. Gil de Ferran, who gave Penske one of his record 16 Indy victories, likes to tell a story about an incident that occurred shortly after Penske hired him. Team owner Roger Penske is in his 50th year as a team owner. That’s Penske. He doesn’t take long to recharge. And few people can keep up with him for very long. His longtime right-hand man Dan Luginbuhl, now retired, always kept a packed suitcase in the trunk of his car so he could dash to the airport to meet Penske when those inevitable late-night calls came. That energy translates to a lot of success, and nobody has had anywhere near as much success at the Indianapolis Motor Speedway as Penske. Asked what it is about Penske that brings victories at the Brickyard, three-time Indy winner Helio Castoneves had a simple answer: Leadership. Penske, once one of the most promising young racers in the sport before giving up driving to concentrate on business, will get back behind the wheel on Sunday, driving the pace car at Indy for the first time. As usual, The Captain will watch from the pits, managing the race for Castroneves. Penske’s most successful driver at Indy has been Rick Mears, who won here four times before retiring to become a driving coach for Team Penske, a position he still holds. Racing legends A.J. 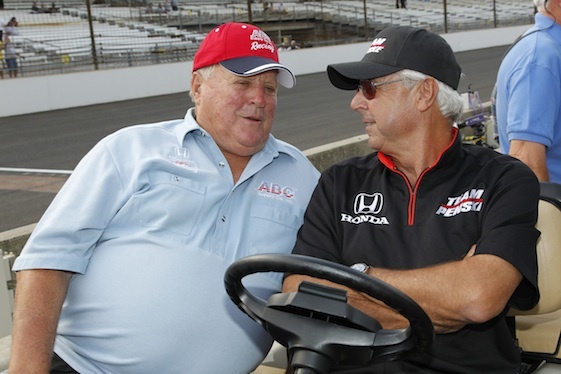 Foyt and Rick Mears. Not surprisingly, Penske believes that his most important lesson at Indy came in one of his worst moments here. Penske first came to Indy with his dad as a 14-year-old. It was love at first sight. 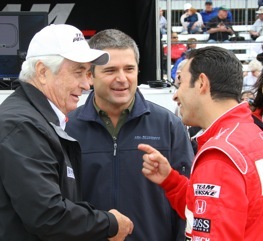 Helio Castroneves talks with owner Roger Penske and former teammate Gil de Ferran in 2009. Since then, he has visited Victory Circle with Mears, Bobby Unser, Al Unser, Danny Sullivan Emerson Fittipaldi, Unser Jr., de Ferran, Castroneves, Sam Hornish Jr., and defending champion Juan Pablo Montoya. Now he is about to celebrate that 50th year in racing. After Castroneves gave him his record 17th victory in the annual Indy pit stop contest on Friday, Penske was asked if he is excited about that 50th anniversary.